After a quick trip to the nation’s capital, the Yankees were back at the friendly confines on Tuesday night and opened their series with an easy 7-2 win over the Mariners. 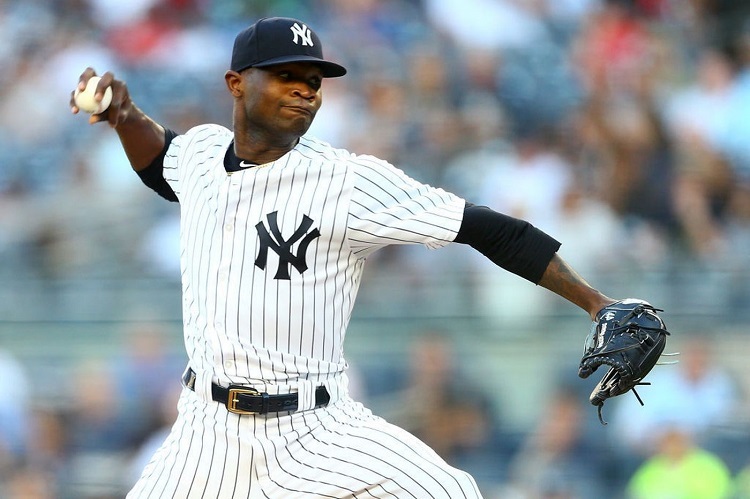 Domingo German was absolutely brilliant in his eighth career start. After giving up a run (unearned) in the first inning, he retired 19(!) straight batters before Nelson Cruz tagged him with a solo homer in the seventh. He pitched a career-high seven innings, surrendering just two hits while striking out nine and walking none. It was the second time this season he’s allowed no more than two hits and gotten at least nine strikeouts, earning our #funfact of the series: Since his first start on May 6, the only other MLB pitcher to have two games with those stats (2 or fewer hits and 9 or more strikeouts) is Chris Sale. German’s dominance has peaked in the last two weeks. Over his last three starts, 28 of the 51 outs (55%) he’s recorded have come via strikeout. And for the season, he’s shown elite swing-and-miss stuff, with a 15.7 percent swinging strike rate that is the second-highest among all pitchers with at least 40 innings pitched. Giancarlo Stanton ignited the Yankees home run derby with a game-tying solo shot in the bottom of the first inning off Mariners southpaw Marco Gonzales. He entered the game with a .435 ISO (Isolated Power) against lefty pitchers, the highest mark in the AL (min. 50 PA). Miguel Andujar made sure the fans at Yankee Stadium would go home happy, crushing a career-long 427-foot home run in the fifth inning that put the team ahead 3-1. Aaron Hicks added a few insurance runs with his own two-run bomb later in the fifth, going deep in back-to-back-to-back games for the first time in his career. Sixth walk-off win of the season, one more than they had all of last year and tied for the most in the AL. 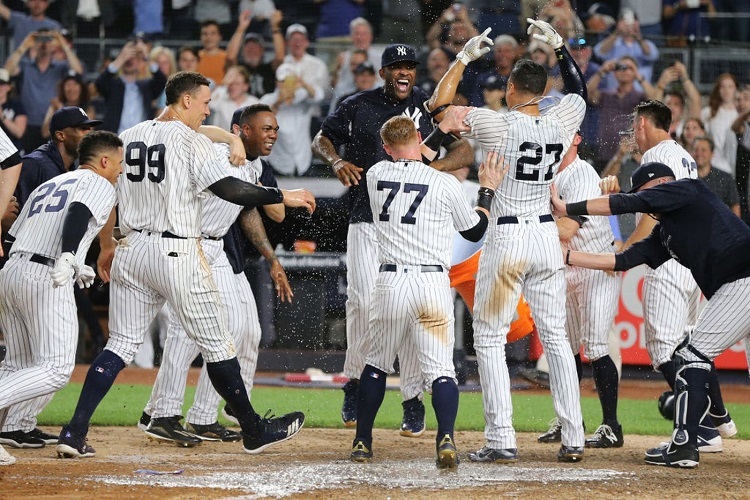 The last time the Yankees had six walk-off wins this early into the schedule (71st game) was 2009. Third walk-off homer of season, tied for the most in the AL and the same number they had all of last year. The last time they had three walk-off dingers this early into the season was 2009. 23rd comeback win of season, the most in the majors. By the way, the 2009 team also had 23 comeback wins in their first 71 games. Hmmm … sensing a trend there. Gary Sanchez was the first hero of the night, tying the game in the eighth with a massive 439-foot two-run homer. It was his team-best third home run in the eighth inning or later that either tied the game or gave the team a lead; he had never hit one of those before 2018. The Yankees are now 11-0 in games that Sanchez goes deep this year. Giancarlo Stanton then capped the rally with a two-out, two-strike mammoth shot over the wall in left-center. It was his fourth career walk-off longball and first as a Yankee. The poor baseball went a projected 453 feet, the longest walk-off home run recorded by Statcast (since 2015). 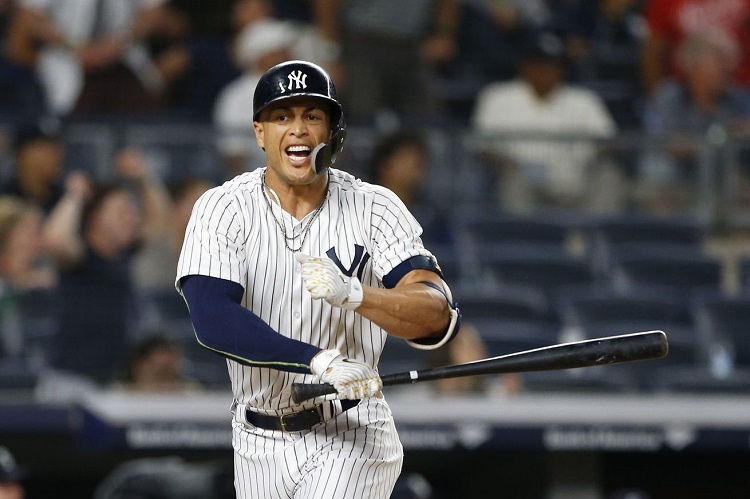 And to celebrate his first True Yankee Moment, let’s give Stanton our Obscure Yankeemetric of the Series: Over the last 30 years (when we have reliable pitch data), he is just the second Yankee to hit a two-out walk-off homer in an 0-2 count. The other was Jason Giambi on June 5, 2008 against the Blue Jays off reliever B.J. Ryan in the bottom of the ninth. Because this team simply refuses to lose … the Yankees completed the sweep of the Mariners on Thursday afternoon, holding on for a 4-3 win. They are now 19-18 when scoring four runs or fewer this season; every other team is at least three games under .500 in that situation. Looking ahead, the last MLB team to finish with a winning record in games when scoring no more than four runs was the 1979 Astros (57-56), and the last AL team to do it was the 1954 Cleveland Indians (41-39). 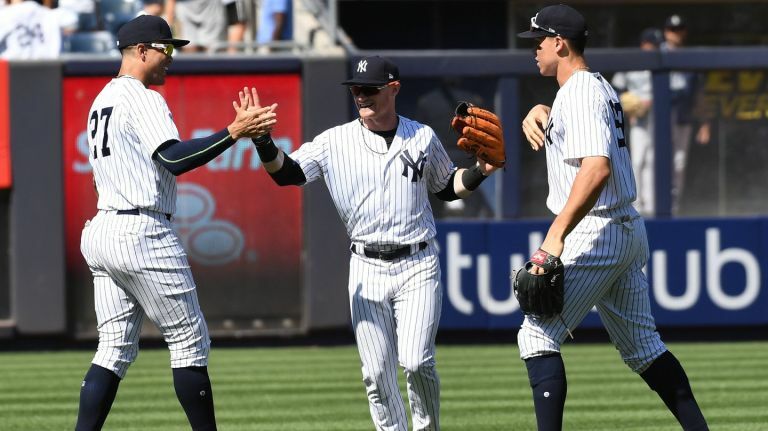 The Bronx Bombers did all their scoring in the first inning, as Aaron Judge and Miguel Andujar both smashed two-run homers to give the Yankees an early 4-0 advantage. Andujar’s blast was his 10th of the season, making the Yankees the only team in MLB with seven double-digit homer players in 2018 (Red Sox have six). The only other time in the last 15 seasons that the Yankees had seven players hit at least 10 dingers before July 1 was 2009. The third baseman joined Gleyber Torres in the 10-homer club, producing yet another pinstriped record: they are the first set of Yankee rookie infielders to hit at least 10 homers in the same season. The last pair of Yankee rookie teammates at any position to do it were Gil McDougald and Mickey Mantle in 1951.